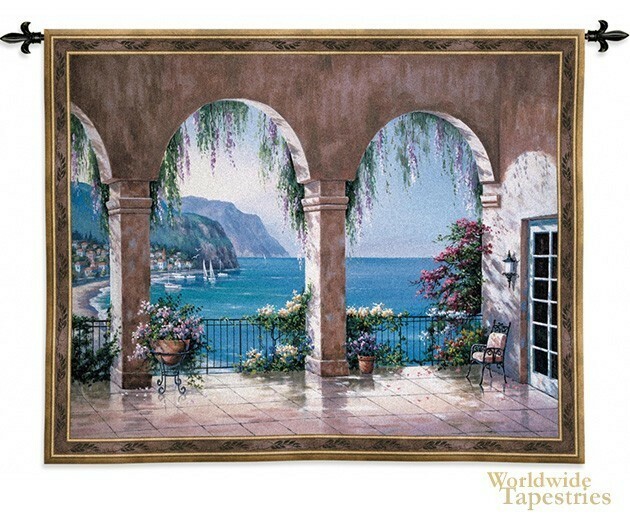 This tapestry "Mediterranean Arches" shows the Italian Mediterranean seaside, the artwork of Kim. Here we see the brilliant blue water of the Mediterranean coastline with the gentle waves and rocky coast filled with greenery and villas. The arches here frame the piece decorated with abundant flowers of the wisteria as well as potted color. The Mediterranean is reflected here by the rich blues and greens as well as the multiple hues of the flowers. This tapestry "Mediterranean Arches" is backed with a lining and has a tunnel for easy hanging. Note: tapestry rods and tassels, where pictured, are not included in the price.